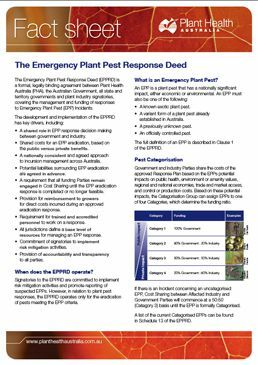 To find out more about the EPPRD, download the fact sheet, visit the EPPRD Q&A page or contact Susanna Driessen, General Manager Emergency Response and Preparedness, on 02 6215 7700. 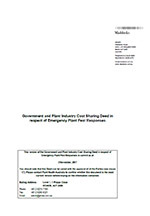 While the EPPRD covers the plant sector, there is an equivalent agreement for the animal (livestock) sector called the Emergency Animal Disease Response Agreement (EADRA). The National Environmental Biosecurity Response Agreement (NEBRA) sets out emergency response arrangements, including cost-sharing arrangements, for responses to biosecurity incidents that primarily impact the environment and/or social amenity and where the response is for the public good.